A: As a safety feature there is a knot before and after each bead, so that even in the extremely unlikely event the string becomes torn, the beads will not scatter. Amber necklaces are secured with a traditional screw clasp or a pop out clasp, not a hook and ring and not a magnetic clasp. The screw clasps are made to break away from the strand at the clasp as shown below. This is a safety feature to prevent strangulation. This does not mean your necklace has broke it means that the safety feature has been activated, but it will need to be repaired before use again or replaced. Our pop out clasps will simply pop out at the clasp leaving your necklace fully intact, and no need for repair, just simply pop it back together again and again. At this time I do not perform repairs for necklaces whose safety feature has been activated. However, I do know a friend in the business that could repair the jewelry for you for a fee. If you would like her information please contact me and send me a picture of your broken clasp and I can get you a price break down for repairs. As with all things, please don’t leave children unattended with their amber necklace or bracelet on due to possibility of choking hazard and strangulation. A: These necklaces are not made to chew on, so when purchasing for children under the age of 3 years old, please make sure to use the information to make sure you have a proper fitting necklace. Our necklaces come in 11 inch and 13 inch sizes for children Get a string or another necklace that you have at home and use it to measure around your child's neck. When doing so you want to make sure the length is not long enough to roll over your child's chin and into their mouth. Also make sure that you have a width of 2 finger spaces between the necklace and the child's neck to give enough length for comfort. The pictures below are of my 2 year old wearing an 11 inch necklace and a 13 inch necklace. The butterscotch colored necklace is NOT a proper fit and is too long because it can fit over her chin and I can fit 3 to 4 fingers between the necklace and her neck, the mixed Baltic amber necklace would be considered a proper fit as I can only fit 2 fingers between her necklace and her neck, and it won't fit over her chin so she can not put it in her mouth. A proper fit is important because amber is a brittle tree resin. 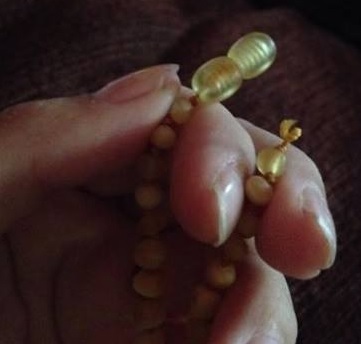 Although it is completely harmless if swallowed, the beads can break off if your child bites down on them and if the bead breaks it could pose a possible choking hazard for little ones. Q: What is your Baltic Amber made from? A: My products are manufactured from ecologically clean natural amber without admixtures or chemical additives. You will never find any piece of fake amber offered for sale by me. My products are made from genuine Baltic amber, and all of the amber I offer comes hand made and shipped directly from Lithuania, which is its original place of origin. Q: What healing properties does Baltic amber have? A: Nowadays, like in the past, amber is used both as an adornment and as a curative means for various illnesses. Europeans have regularly used amber as a part of their regular health routine. In countries around the Baltic Sea (where authentic Baltic Amber is collected) amber is commonly sold in drug stores. and the list goes on. You can find a lot of of articles pertaining to Baltic amber and its unique healing properties. Q: How does Baltic Amber work? A: A natural analgesic, recognized by allopathic medicine, amber will help calm a baby without resorting to drugs. Used for centuries in Europe, amber's natural anti-inflammatory and pain relieving properties are perfect to soothe teething babies and treat adults alike. Amber is a fossilized tree resin, which warms against the skin, releasing its therapeutic properties safely and naturally. In 1886 Nobel-prize winner Robert Koch, the pioneer of modern bacteriology, confirmed positive influences of succinic acid (the active component in raw amber), and found that there was no risk of accumulation of surplus amounts in the human body. Recent scientific research has also proven that succinic acid strengthens the body and stimulates the immune system. For best results keep your amber tucked under clothes and in contact with skin as much as possible. Q: What's the big deal about Lithuanian Baltic Amber? A: Baltic amber can only be found off the coasts of Lithuania, and is the only amber that has the pain relieving element succinic acid, therefore it's the only healing amber for use associated with pain relief and for teething babies. Lithuania is located near the Baltic sea, featuring the oldest amber inimitable in its beauty, believed to be over 60 million year old. This amber is found mostly along the banks of the Nemunas, Streva, and Sirvinta rivers and the Lukstas and Plateliai lakes. Small pieces of amber can be found floating in the sea, and washing up on shore. Each piece is handcrafted by Lithuanian artisans, who carefully round the shape of each Baltic amber bead so it rests gently against the skin. This ensures maximum skin contact and comfort. Q: UNPOLISHED vs POLISHED Amber, which is more effective? A: "RAW Baltic amber is unprocessed, untreated amber that has come directly from the Baltic Sea. It is the true form of amber and also contains extra layers of succinic acid which is what relieves pain and helps with all other issues amber can help with. Since raw amber does have extra succinic acid, it is considered (and proven) to be MAXIMUM strength amber. Due to the great relief Raw amber gives it is the only amber I will use on newborns for gas and colic and is also what I recommend most for severe/chronic pains and GERD! You can also make your raw amber look polished by soaking it in coconut oil and water. This will not effect the amber's healing ability it will just makes the colors more vibrant. Polished Baltic amber This amber does still contain succinic acid in healing amounts and works well with teething babies as well as other issues even in adults. This amber is often used for pain relief and works very well. Some of the pores on the amber surface are sealed during the polishing process preventing it from releasing as much sucinnic acid as unpolished amber. However, it still releases healing properties and it absolutely beautiful and shiny. Q: Do certain colors have better effects than others? A: All colors of amber heal the same. The condition (RAW or Polished) is what really makes the difference for those needing the extra pain relief." So buy what color appeals most to you without worrying if it will heal the same as another color. Colors have nothing to do with amber's ability to heal. Q: How can I test my Baltic Amber to make sure it is genuine amber and not imitation? Inspect and feel: Hold your amber in your hand. Amber should be lightweight and warm to the touch, it should never be cold, but glass will be heavy and cold to the touch. Look for natural imperfections - cracks and small bubbles are common in real Baltic amber. If your beads are perfectly symmetrical and identical chances are you have a fake. Static: Rub your amber between a soft piece of cloth, or against carpet or fur (we used a piece of fleece.) True Baltic amber will create enough static electricity to attract a small piece of paper. This can take a few tries before you build up enough charge. Don't give up the first try. Black Light Test: This test is actually kind of fun. You will need some form of ultra-violet (UV) light, commonly known as a black light. Using a UV flashlight is the easiest. If your amber beads are true Baltic Amber, they should create a fluorescent glow from the black light. Depending on the color of your amber beads, the fluorescent glow could be anywhere from a yellow-green to a bluish hue. It is more subtle in polished amber, but you can see the difference between the plastic clasp and the amber beads. Raw amber and lighter shades of amber picks up the UV much better. Here is an examples of what it should look like. The clasps are plastic and the necklace itself is made of amber beads. You can tell a real difference between the clasps and beads, which tells you it is authentic amber and not resin or plastic. 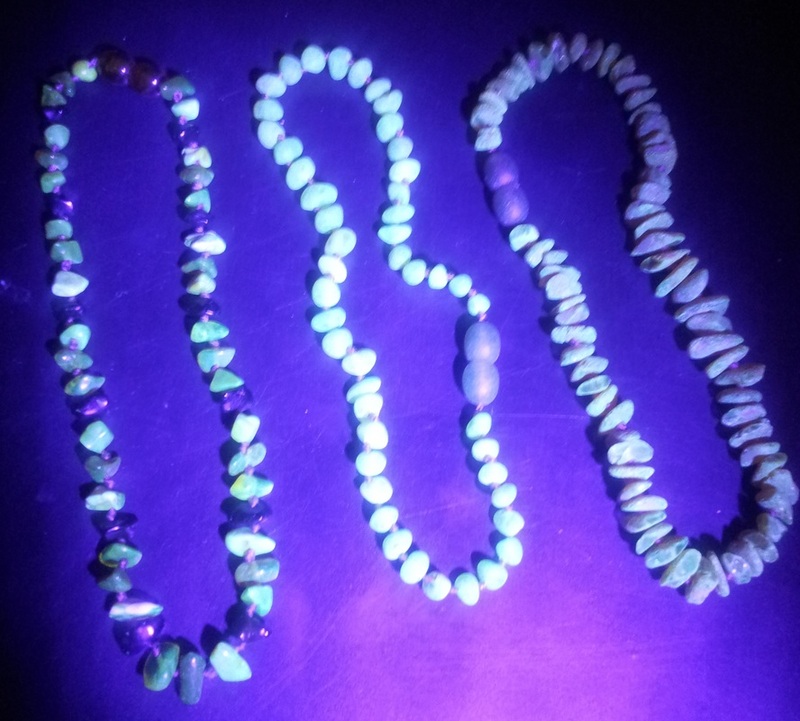 I am using a black light flashlight, so the light is not evenly distributed over the necklace, but you can still tell a huge difference. Scratch test: If you don’t mind the potential of damaging a bead, try the scratch test; scratch your amber with something metal. Amber is soft enough to be scratched by metal where glass is too hard to see a visible mark. Acetone Test: The acetone test is pretty accurate when attempting to distinguish true Baltic Amber from other resins like Copal or from plastics. Drop a few drops of acetone on your amber. True amber will not be affected or harmed by the acetone, but plastics, copal or other synthetic resins will likely turn sticky, and colors may rub off on to a cloth or cotton ball if it is fake. Hot needle: Heat a needle until the point is glowing red and push it into the bead, this will leave a burn/mark, so do it somewhere you won’t mind ruining. Also, amber is fragile, sticking it with a hot needle you will notice some cracks, this could damage your bead. A needle will pierce plastic without cracking it. Knife test: When scraping a knife against amber you should not be able to cut slices or shavings. Amber is harder than that and should flake or crack off instead. Q: How do I care for my Amber? A: Because amber is a soft resin it can be brittle, it’s important to be careful so your beads do not become cracked or break. Your amber should not be stored with other items or jewelry where it can rub against other pieces, especially metals. Be sure to keep perfume, hairspray, and soaps like shampoo and conditioner away from your amber, and never place your jewelry in commercial cleaning solutions. Remove your amber jewelry when bathing, water is ok, amber is allowed to get wet, but mineral and calcium build up can leave deposits on your amber over time. Also remove when applying sunscreen or going to the pool because chemicals can render your amber useless. Adorable Amber can not be held liable for improper use or damage that occurs to your item once delivered, so please treat your items with care. Q: How do I clean my Baltic Amber jewelry? A: To clean your amber, use a soft flannel cloth or an unused toothbrush dampened with clean lukewarm distilled water (I say distilled to prevent mineral and calcium build up on your amber). Dry with a clean cloth or towel. Be sure to allow your amber to fully dry before wearing. For tough gunged on foods and sticky stuff you can soak your amber necklace in warm water for about 5 min. and then swish in the water to loosen any debris and follow the steps above. Super simple! 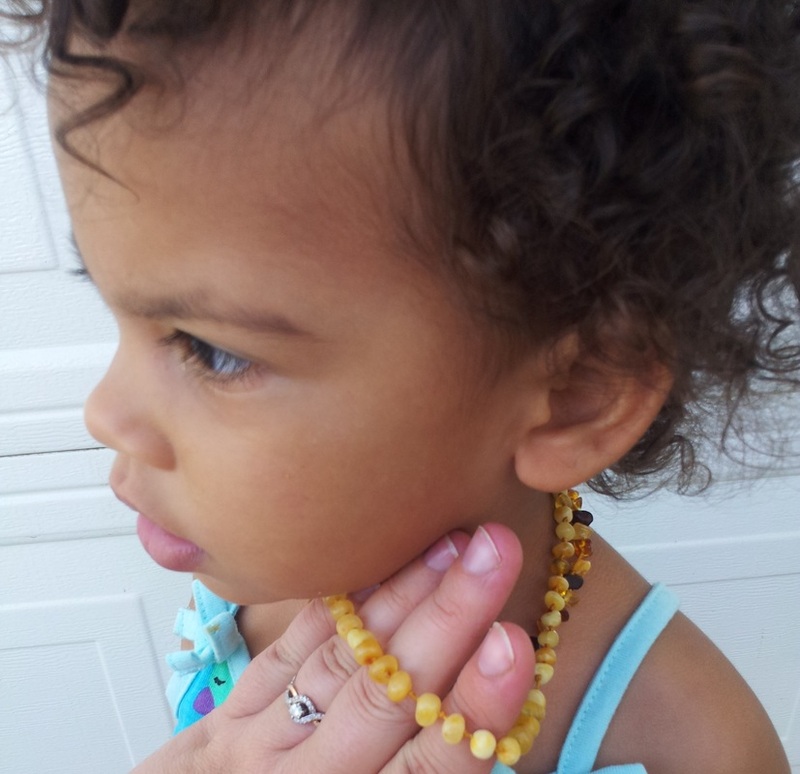 Baltic Amber teething necklaces should be removed when baby is sleeping or unattended! 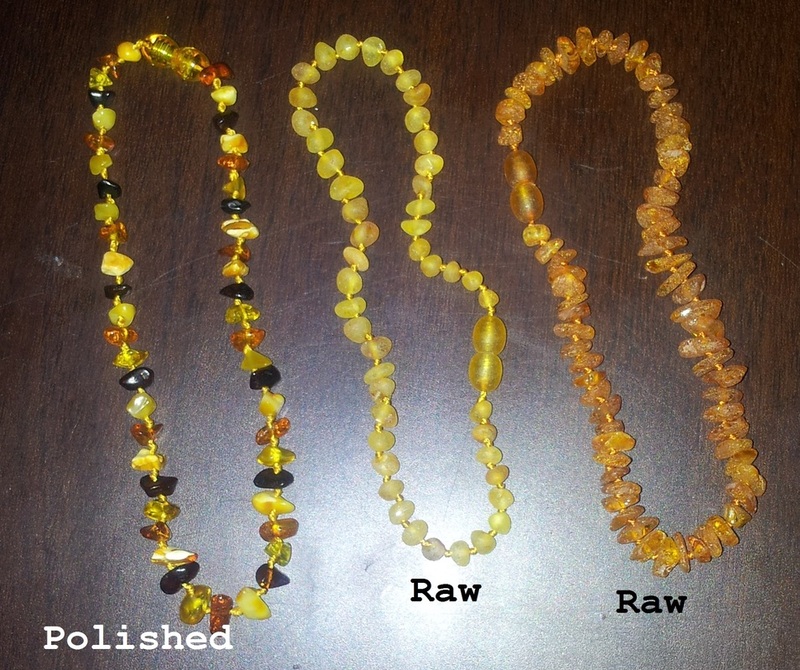 Baltic Amber necklaces are made for wearing, not for chewing! 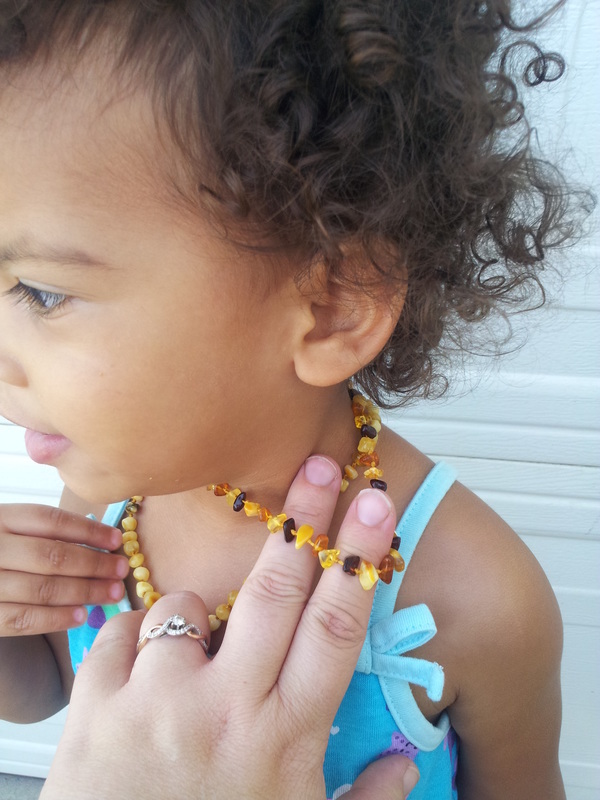 Please use caution and supervise your child while using the Baltic Amber necklaces! When small remnants of amber are fused together using high pressure or major heat source, the result is called “pressed” amber. While pressed amber is cheap and relatively available, it will not perform the same way original natural amber does. Because the original pieces of amber have been compressed, the singular power of each piece is compromised. It is inexpensive to buy but if you’re interested in the the healing aspects of Baltic amber, you will not experience them with the pressed product. Pressed Amber will look more like plastic, perfectly round, no air bubbles or imperfections. However, it will burn and smell like real amber, so you have to rely largely on a visual inspection to tell pressed amber from the naturally formed beads. Obviously none of these fakes will provide the health benefits that our customers are seeking, so we only carry real Baltic amber imported directly from Lithuania in the Baltic region. Adorable Amber can not be held responsible for any misuse or harm that may come from improper use of our products. 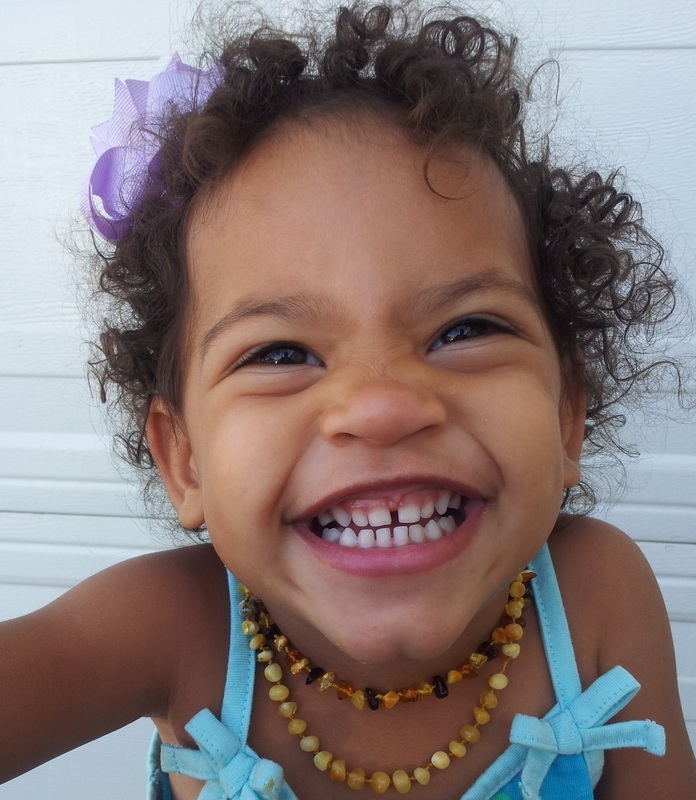 Please practice common sense when using Jewelry on children under the age of 3 years old. Never leave your child unattended with anything around their neck. These statements have not been approved by the FDA.